Unless we include certain ants who keep and milk aphids, humans are the only species who “domesticate” animals of other species, i.e., hold them in captivity. And what a variety of creatures! Beings of land and sea, from gigantic elephants and whales to the barely visible, from mammals not entirely unlike us to alien-seeming serpents and edible snails, exist in human-made prison cells along the labyrinths of life. They are confined for all sorts of purposes, from love to brutal labor or food, and in all sorts of ways, from almost regal bounty to conditions little different from those of a concentration camp. This captive animal realm in the shadow of humanity is the burden of Tripp York's study, short and highly readable, yet by no means lightweight. He opens with an account of the 1514 gift by the king of Portugal of a small white elephant brought from his possessions in India, and presented to Pope Leo X, the pontiff who confronted Martin Luther. Whatever other faults that ruler of the church may have had, he loved and cared for the animal, named Hanno, with almost extreme devotion. (Indeed, certain grumpy Protestant critics took Hanno's favored status as one more sign of the hopeless corruption of the Vatican.) But only Hanno knew whether he enjoyed that indulged life in the eternal city, or would rather have been back with his family amid the jungles and dangers, but also the freedom, of his homeland. This curious story leads York into a lengthy consideration of zoos. He knows whereof he speaks. While a religious studies professor and ethicist at Virginia Wesleyan in Norfolk, he also worked for two years as a volunteer in a nearby zoo, shoveling, he tells us, vast amount of elephant and giraffe manure. He also conversed with the zoo director, a thoughtful friend of animals; some of the dialogue is included here. The zoo dialectic offers much "on the one hand, but on the other hand" kind of writing, but it is hard to see how, when it comes to zoos, one can get much beyond that. 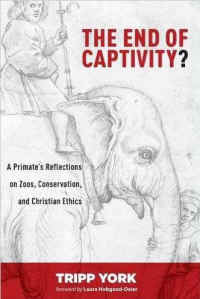 Zoos imprison yet they also preserve; they distort the lives of animals yet they also educate humans. As habitats disappear in the wild, zoos maintain species even as their lives become increasingly artificial. The best York can hope for is for zoos to get better and better in terms of animals' living conditions, as the good ones have in recent years, and that the opportunity to see certain endangered species therein may inspire some attenders to devote serious effort to their preservation in freedom. No such ambivalence obtains as York moves on to the immensely vaster and more tortured animal confinement of the food industry. He is totally against it, and as a Christian ethicist lines up a very helpful series of Bible quotes supporting what he convincingly holds is the biblical position on animals, summarized in four points: that animals do not belong to us but to God; that their ultimate purpose is not to serve us, but to serve God; that God cares for all animals, both human and nonhuman; and finally that animals like us will forever reside in God's kingdom. Needless to say, not everyone agrees. The author in his characteristic fair-minded and entertaining way includes dialogues with students who, at best, were still wrestling with the issues. One, for example, was passionately committed to saving elephants, yet ate the meat of cows without a second thought. When York confronted him with this, he was dumbfounded, obviously having never thought about the contradiction, but finally could only say that cows are meant for humans to eat (differing here, York points out, with Hinduism), while elephants apparently are not. York himself lists sixteen reasons why he is a vegetarian, and has been since his college days, a catalog many readers may find helpful for their own thinking. Toward the end, York resurrects yet another dialogue, this one with Fred, an old friend from graduate student days, now an experimental farmer who has developed a highly humane form of animal agriculture he offers as an alternative to factory farming. Fred is not a vegetarian; indeed he sees eating meat as a kind of sacrament, and considers vegetarianism to be "ecologically naive." Needless to say Tripp York, though respecting what Fred is trying to demonstrate through his model farm, does not agree, but their exchange of ideas is stimulating. I always end up on York's side, but appreciate his ability to enter into other lives, both human and animal, and give life both to the complexity and the excitement of animal issues. This highly recommended book can be read in an afternoon, but will leave you with much to think about for weeks. Tripp York, PhD, teaches in the Religious Studies Department at Virginia Wesleyan College in Norfolk, Virginia. He is the author or editor of a dozen books, including The Devil Wears Nada, Third Way Allegiance, and the three-volume series The Peaceable Kingdom.